How An Aqueduct Turned Los Angeles Into A 'Garden Of Eden' The pipeline that brings water out of California's Owens Valley to metropolitan Los Angeles turns 100 this month. The water wars it has spawned over the century still simmer, and the issues of water use, scarcity and stewardship are inextricable — if often invisible — to life in the city. 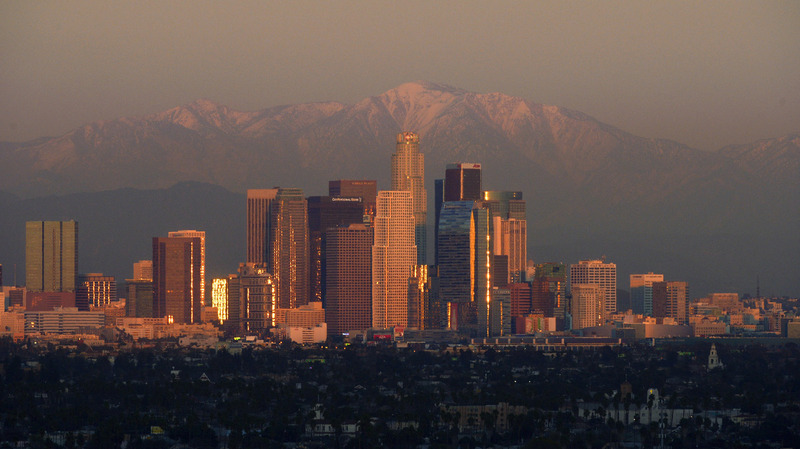 Los Angeles saw a dramatic boom in growth after the construction of the Los Angeles Aqueduct in 1913. The system delivers water from the Owens River in the Eastern Sierra Nevada Mountains to the city. Today the beauty of Los Angeles is dramatically symbolic of the ancient prophecy the desert shall "blossom like a rose." This blossoming was made possible by the birth of the Los Angeles Aqueduct, opened 100 years ago this month. The opening of the aqueduct might as well have been the birth of the modern West and the image of the city as a Garden of Eden. The vast quantities of water the aqueduct moved made Los Angeles, Las Vegas, Phoenix and other cities across the region possible. The project fulfilled the vision of William Mulholland, then L.A.'s chief water engineer. As he stood in front of 40,000 spectators on the day it opened, Mulholland gestured toward the water cascade charging down the hillside and declared, "There it is. Take it." 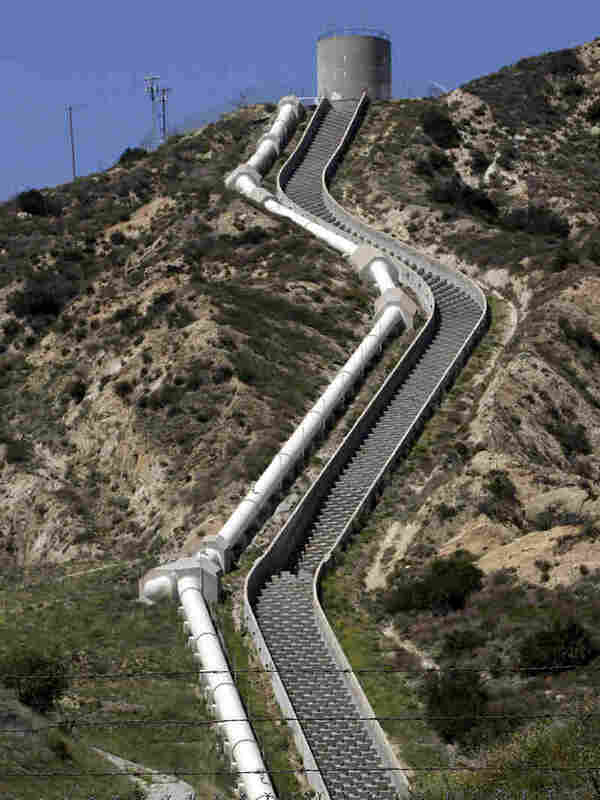 Water flows through The Los Angeles Aqueduct Cascades near Newhall Pass in Sylmar, Calif. The aqueduct, which carries millions of gallons of water to the city of Los Angeles, turns 100 years old this week. But as with all things, the aqueduct also came at a price. The $23 million Los Angeles Aqueduct project took 5,000 workers five years to complete. It also finished on time and under budget, something you might not hear a lot these days. "The state of California would be different, arguably the world would be different, without the L.A. Aqueduct," says Jon Christensen, the editor of Boom Magazine. The publication's latest issue looks at the 100-year anniversary of the aqueduct. While the aqueduct brought water to Los Angeles, it also took it from somewhere else: Owens Valley. Christensen tells NPR's Arun Rath that over the years there was a lot of anger and accusations that L.A. took the water by force. "People sold their agricultural lands and their water to the city of L.A.," he says. "There's lots of claims and evidence that some of that was done secretly, without identifying who the real buyers were ... but there were also a lot of willing sellers." That anger manifested itself in the form of protests and even a bombing of the aqueduct. The 1974 film Chinatown, starring Jack Nicholson, helped perpetuate the myth that the "big city came and took what it wanted." But the film took a few liberties with the true story of the city's water. "Almost nothing about [the film] is historically accurate," Christensen says. Chinatown might be fiction, but the century's worth of mistrust between Los Angeles and rural Owens Valley is real. The valley is sandwiched between some of the highest peaks in North America and the deserts of Death Valley. One area that stands out is a flat lake bed that was formally like salt flats. That dusty, briny pancake as big as San Francisco is the now-dry Owens Lake — a direct consequence of 100 years of the Los Angeles Aqueduct, says Marty Adams, director of water operations for the Los Angeles Department of Water and Power. "Even Teddy Roosevelt, who was the president of the United States, declared that it was way more valuable to bring that water down to the city of Los Angeles so that the city could grow, than it was to let it flow into the salt water of Owens Lake," Adams told NPR's Kirk Siegler. But when the wind blows here — and it does a lot — the dry lake bed can fuel massive dust storms. This area has long carried the dubious distinction of being the largest single source of particulate pollution in the country, and farther upstream the Owens River all but disappeared. "At one time this valley floor was lush, green, orchards, fields ... we lived off of this land," says Mel Joseph, who lives in nearby Lone Pine. Joseph, a member of the Lone Pine Paiute-Shoshone Tribe, grew up in the valley and always heard stories about what it used to be like before Los Angeles started buying up land, water rights and building dams and channels. He says people here are still struggling with asthma and other health issues attributed to the dust. "It's a desert climate, but they made it the Dust Bowl that it is today," he says. But some things have been done to cool these tensions lately. A few years ago, led by then-Los Angeles Mayor Antonio Villaraigosa, the city started pumping thousands of gallons of Sierra Nevada water back into the Owens River channel. Under court order, the city has also spent more than $1 billion so far on dust controls, covering more than 90 percent of Owens Lake. Everyone agrees the air has gotten a lot cleaner. Yet many locals rolled their eyes again when the city went back to court this year to argue that the cleanup job there is done. If nothing else, the quibble over that last 10 percent of uncontrolled dust is a sign that one of the greatest water wars in the West isn't going to end anytime soon. The ability through technology to move water from one area to another has created water disputes in many other areas was well, with cases in Oklahoma, Texas, Georgia and Florida. Doug Kenney, director of the Water Policy Program at the University of Colorado Law School in Boulder, says it is just the nature of these interstate water disputes to drag on for a long time. "When I got out of college 20 years ago, the first thing I worked on was this dispute between Alabama, Florida and Georgia," he says. "And it's still going strong." While "it still pays to be the big guy" in these water disputes, Kenney says, "but it's not as extreme as it used to be." He says the conflict surrounding the Los Angeles Aqueduct has served as a model for how not to behave. Mark Gold, associate director of the Institute of the Environment and Sustainability at the University of California, Los Angeles, says L.A. has made amazing strides in conservation. The city consumes the same amount of water it did in 1970, with 1 million more residents. "If you compare them to other major cities nationally, they're around 123 gallons per capita, per day, which is the best in the entire nation," Gold says. But best in America is still more than double the typical water consumption in Europe, so there's a long way to go. He says the the city needs to continually move forward with tougher plumbing standards, which are required by the state, and having tiered pricing on cost. "So from the standpoint [of] if you're a water-waster, you're paying a lot more by gallon than if you're actually conserving water well," he says. "You would start hopefully getting people to start conserving more and more because you actually have an economic interest in doing so." Still, Gold says 80 percent of the water in the state of California is used for agricultural purposes, and he says that needs to be reduced. So the Garden of Eden will be around for a while longer; it just might have fewer lawns and golf courses, and more water recycling. NPR's Kirk Siegler contributed to this report.